If you are interested in staying here, you will need to send a message to the host Mihaela indicating your interest. For a formal booking to ensue, Mihaela will need to send you an "invitation to stay", which you can then accept. Included: TV with access to Netflix, 6 stainless appliances, internet access, access to indoor pool with rooftop terrace, access to indoor gym. Parking: on the street $3.5 per hour (and free after 7pm or 9pm depending on the exact street). Weekend indoor parking nearby for $5 per day. During weekdays, outdoor parking costs between $15 and $20 per day. 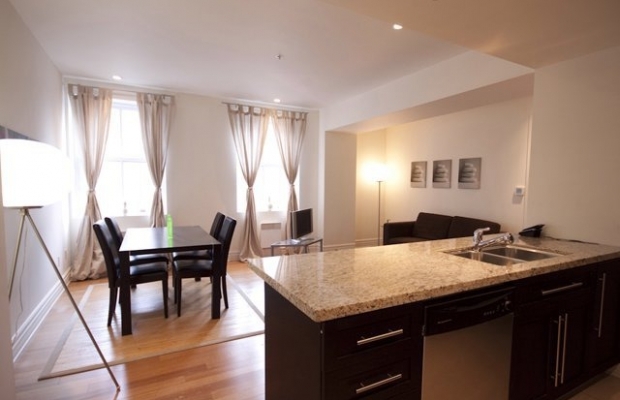 Lovely 1 bedroom condo in the heart of Old Montreal in the proximity of the Notre Dame Basilica. Close to the Jacques Cartier Square, Old Montreal's art galleries, cafés and restaurants. Ideally located to enjoy Montreal's festivals. Easy access to the subway network, train station and Trudeau Airport. Access to rooftop indoor pool & outdoor terrace. Access to indoor gym.